Alex Cunningham has pledged to champion the concerns of local people with a terminal illness by lending his support to Marie Curie’s campaign calling for the right for everyone to have palliative care when they need it. 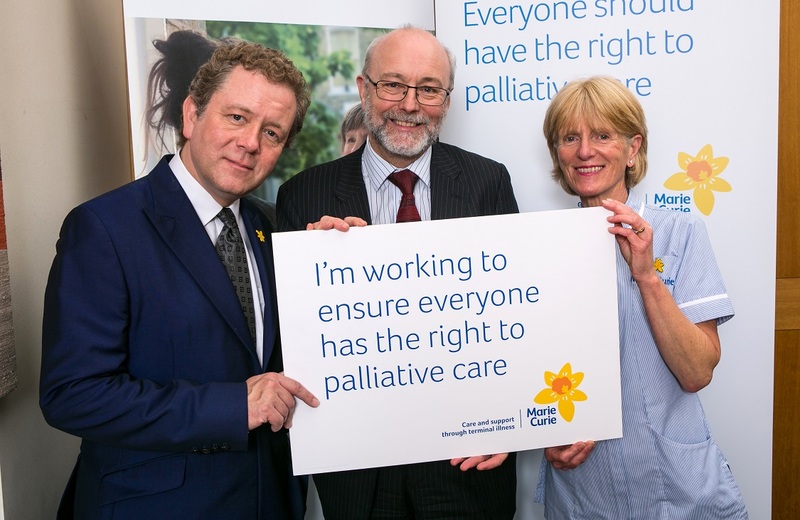 The Stockton North MP teamed up with Marie Curie nurse Sally Monger-Godfrey and renowned impressionist Jon Culshaw to back the campaign from the UK’s leading charity for people living with any terminal illness and their families. Currently, one in four people each year who need palliative care miss out because their needs are not recognised and they are not referred on to the right services. To prevent this figure from increasing, Marie Curie is calling for a change in the way care is provided. The campaign comes as Marie Curie revealed that more than half of the 26 million people over the age of 50 in the UK are not confident that they will get the care they need towards the end of their life. “It is distressing that so many people are missing out on the care they are entitled to in their hour of need. And that more than half of over-50s worry they will find themselves in a similar situation only makes matters worse. Scott Sinclair, Head of Policy & Public Affairs for England at Marie Curie, said: “We are incredibly grateful to Alex for supporting Marie Curie’s campaign. More needs to be done to ensure that people with a terminal illness get access to the high-quality care and support they need and deserve.